I got some trouble with this setup and found out it was the Streacom PSU. The most powerfull PSU for low profile cases I could find was the HFX EF28 and with this the pc worked fine. When the GTX 670 came I ordered this and another EF28. I wanted to combine two PSU's and see if I could drive a graphic card with two PSU's ment for low profile cases. This was not a success (as expected). The pc booted but when I tried a game it broke down emediately, sometimes just for playing a blueray. I found out the only solution for a pc with graphic card is a ATX PSU. I ordered the Seasonic Platinum 1000W just to be shure to leave out the power troubles and because of the power overkill the fan is still or goes slow. With the power solved the pc stil wouldn't work properly and sometimes did not boot. When I put the GPU directly in the MB the pc worked fine so the problem seemed to be the riser card (the first riser was a Delock pcie x16 flexible riser). I changed the motherboard for the Asus P8Z77-M to see if this could manage riser cables better, but the pc was stil unstable. 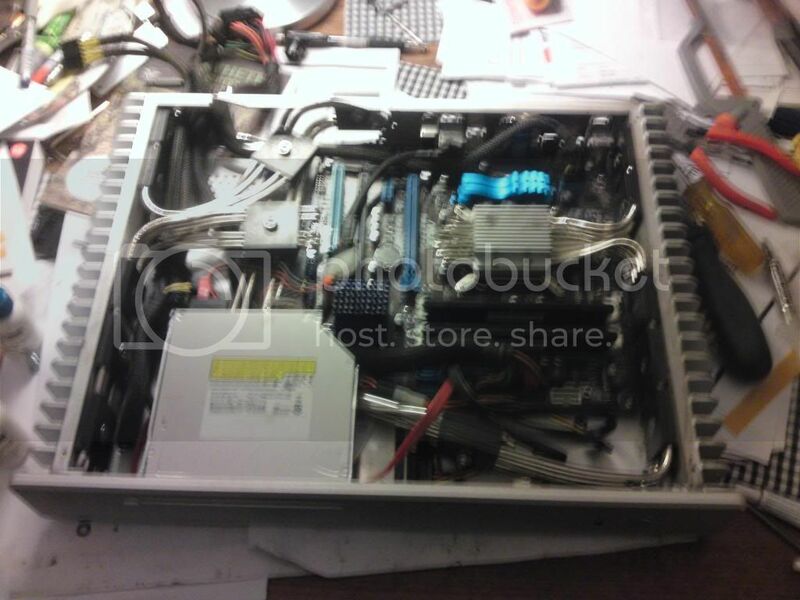 Then I ordered a new riser with a molex powerconnector attached. At first this also was unstable. After reading about the difference between Pcie gen2 and gen3 and that it was no visible differnce I changed the settings in the BIOS to Pcie gen2. After this the pc has worked fine. In this process I also changed the graphic card from GTX 670 (was lucky to get it changed) to the GTX 660ti when this came out. At a time I wondered if the problems was about the graphic card, but it turned out to be the riser. Now when the pc worked properly the cooling system for the GPU was next. I had some training with heatpipes from my old HFX classic pc, so I had thought out how it should be. The bottleneck is actually not the heatpipes but the amount of aluminium and surface of the heatsinks, and this is the weak point of the Streacom FC5 since the case is low profile and small. (Therefore the Streacom FC10 with bigger heatsinks will give better cooling and I believe the FC10 can cool down both the GTX 660ti and GTX 670). I also had to drill some extra holes to better the flow of hot rising air. I have been reading alot of reviews in SPCR and threads on this forum before and have learned alot from it So, thank you for all the good information! When I read the thread "100% fanless midrange system-is this possible?" 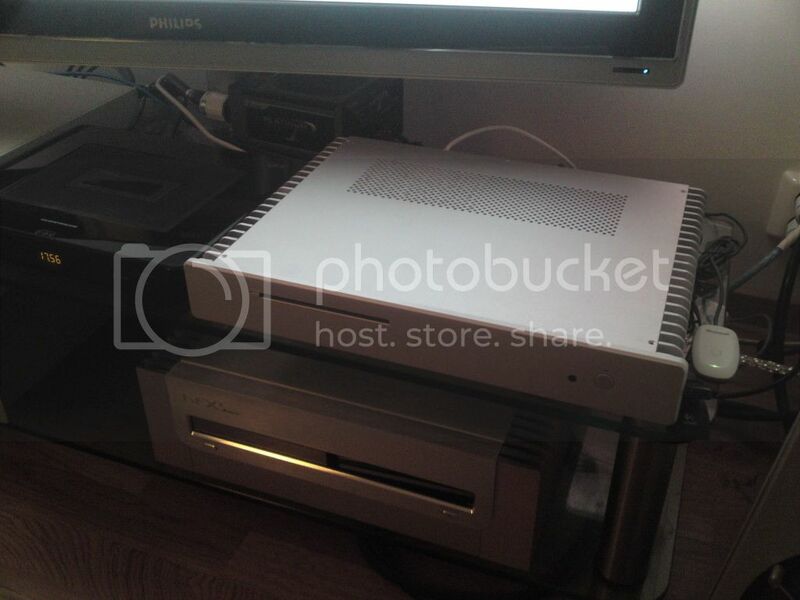 I felt I had to inform you of my project: http://www.silentpcreview.com/forums/viewtopic.php?f=23&t=65196 In that thread I give a more detailed description of how the pc works, and I also describe how I think the Streacom FC10 can be built with an internal PSU and better cooling. I am also confident the HFX classic has capacity to cool down the GPX 670. The pc now works fine. Under ordinary use like surfing the net or playing blueray, the temp stabilizes around 43 C for the CPU and around 38 C for the GPU. I monitor temp with Real Temp, CPUID and Evga Precision X (not shure if these also measure the VRM). While gaming the temp rises. The CPU holds around 50 C most of the time and sometimes a bit higher but seldom over 80 C. The GPU VRM stil gets hot but it seem to be cooled enough. I can play the car game Grid on full settings for hours and the temp on the GTX660ti stabilizes around 70 C, the load is mostly 50-60% but sometimes up to 80%. Need for speed most wanted can't be played on full settings more than 15 min before the temp passes 97 C, and is then on 100% load and peaks up to 120%. On medium settings the temp passes 97 C after an hour. With the resolution on 1920x1080, high details on and the rest on low and a couple on medium settings, the temp is around 70 C and sometimes between 80 and 90 C (this setting can be played for hours). The load is between 60 and 70 % and sometimes around 90 %. Both games hold 60 fps most of the time. It seems like the cooling system can take away around 80 % load of the GTX 660ti and stabilize under 97 C. When the load passes 90 % the temp soon passes 97 C. The testing is done with the case open. I believe the HDPlex H3 has a very good potential. The case only uses one side and is recommended for 65W. HDPlex say new cases without powdercoating on the heatsinks will have 75W TDP. With modding you can use three heatpipes to both sides and with two sides active have a recommended TDP of 2x75W=150W. This will be enough cooling for the upcoming Intel Haswell and AMD Kaveri. As for future possible upgrade of the Streacom FC5 I consider the Seasonic 520W fanless. I also look forward to the chimney cooler from CompTake and hope they will release that one soon: http://tweakers.net/nieuws/82456/comptake-demonstreert-passieve-koeler-met-holle-pijpen.html If this can cool down the i7 3770 I could use all the heatsinks on the case to cool down the graphic card and play better settings on games. I can't play new games on highest settings but since the PC is passively cooled I still think the build has been a success. I feel I have reached my goal of a fanless gaming PC. With this post maybe others can avoid some of the troubleshooting I was through and I also hope to inspire more people to try heatsink cases. Depending on your modding they are not that hard to build, and fairly easy if you follow the standard layout. The price isn't that much higher either if you consider you don't need any fans and cooling tower, and the size can be small because you don't need any airflow. It's very pleasent to have a PC that is totaly quiet, so go for it! Very interesting! I have two passively cooled PC's myself (Zalman TNN500Af and an Atech Mini Client 2500). The Atech is outdated and can't really be upgraded so I'm looking to downsize my TNN system into something that fits on my desk a bit better. The Streacom is a serious option but I have no interest in modding (drilling, etc) but do require a graphics card. With the HFX heatpipes, can you simply screw them in place and have it work? I'd like to duplicate your results (except with a much less potent GPU -- an HD7750) but only if no drilling is required. Thanks for the reply and additional pictures. It might be worth it for me to drill some holes after all. However, it may not be necessary. When I look at Streacom's own manual, it shows the 'GPU side' with pre-drilled holes (identical to the ones drilled for the CPU-side): http://www.streacom.com/downloads/ug/fc5ws_evo.pdf. Any thoughts on whether or not this is going to work? This is good news, it seems like the new FC5 EVO have some positive changes. I have the original FC5 and this case has no holes on the other heatsink. If you can buy an extra coolingsett with four heatpipes from the seller or from Streacom you should be able to mount this upside down on the other heatsink. It looks like the mountingholes for the GPUcooler on the HD7750 is a bit narrower than on the GTX660. Doublecheck that these holes will fit together with the Streacom coolingsett. If the holes goes around the baseplate(lower cpu mount) for the heatpipes it will work, also you will probably have to drill some new holes on the Streacom mountingplate(upper cpu mount). This will be easier with the BorgFX VGA because the mountingplate is smaller and you can drill new holes in the plasticplate(if the predrilled holes here dont fit) http://www.hfx.at/at/index.php?page=shop.product_details&flypage=flypage.tp-ecommerce.tpl&product_id=54&category_id=8&option=com_virtuemart&Itemid=54 The HFX/BorgFX system is also more adaptable if you want to ad another four heatpipes (this is not necessary for a tdp of 55W, but if you later want to try a more powerfull GPU), it is easy to put another mountingplate on top of the other. If you get some screws that fits the pre drilled holes in the heatsink you can also mount the HFX system to these holes, the deal is just to compress the parts together with thermal paste so the heat goes through. This setup will give you very little modding One hole in the case bottomplate to tighten the screw on the GPUmountingplate from underneath, if the predrilled holes in the plasticplate dont match the HD7750 make two new holes in the plastic. For anyone building their own PC this should be a walk in the park! In my case I placed the graphic card a bit longer to the side(but this was a lot of work, so if you dont have to dont do it). This placed the coolingplate for the GPU on the side of the motherboard, which made it possible to tighten up the screw on the mountingplate for the GPU from under the case, through a hole in the bottomplate (you will only have to tighten one screw from under the case with the HFX mountingplate, on the Streacom there is four). If you use a mini-itx MB this will be no problem, but be aware of this if you want to use a micro-atx MB. You did a lot of work with that Streacom case but ultimately it's pointless. That case is destined for something like a 7750 and a 3770t at most. I can't believe that graphics card doesn't melt itself with those puny streacom heatsinks. What's the GPU mosfet cooling like? How did you mod that? The HFX classic is still better for running a midrange card and a full voltage cpu. Better VGA and CPU cooling, internal PSU, can add other expansion cards like tuners, wireless, audio etc. After reading alot of threads on this forum I realise many has a hard time believing in the cooling capacity of heatsink cases. For example when someone ask for buildingadvice for a small, quiet, lowpower PC meant for easy tasks like surfing, music or movies (no gaming), I have seen some being adviced to use ordinary cases, atx PSU's and slow going fans. Sometimes I almost can't believe they mean it, it's like driving a semitruck to the office, overkill and no benefits at all. When you talk about pointless, well there you go. One of the reasons I began building my own PC's was that the competition is so hard the price on parts is kept on a nice and low level, also for endusers. This competition also make the PC components become better and better each year, more efficient and need less power. Take the processors, it's impressive what the Intel i3, i5, i7 or the AMD A10 can do! For those who is not interesting in gaming the internal graphics on these CPU's will do a great job for most people. And the A10 can also do some easy gaming. If you don't need any Pcie cards, a small heatsink case for mini-itx MB will be perfect for many people. You will get a small, totaly silent PC and with few parts the costs will be fine too. You get heatsink cases for Pcie cards aswell. 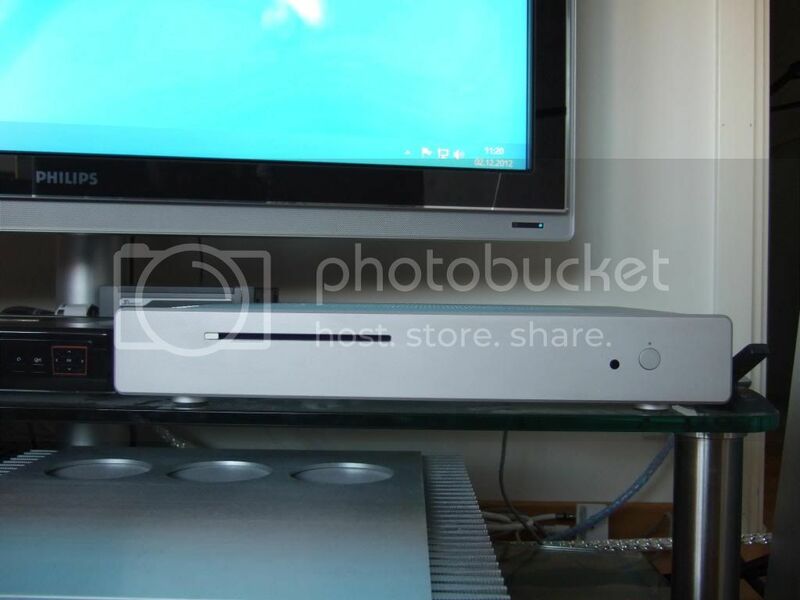 Look at this: http://www.silentpcreview.com/forums/viewtopic.php?f=14&t=65465 The Akasa Euler with i5 3470T would be perfect for many people, and look at the smart and tidy placing under the desk. This case can also house the 3770T you mention. SPCR tested it with a 55Wtdp CPU. And this: http://www.silentpcreview.com/forums/viewtopic.php?f=14&t=65815 The Streacom FC5 with A10 5800K. Another good case is the HDPlex H3 I mentioned in the first post. In my opinion cases like these would be a natural recomendation for people not interested in heavy gaming. And these new CPU's with a SSD is very fast. The Streacom FC5 is recommended for up to 95W tdp and this is the cooling from one side of the case. So when you say the case is for 7750 and 3770T (45W tdp) at most, this is simply just wrong. When you ad a GPU on the other side, the case can take up to 95W on each side. On my FC5 case I also put thermal paste between the heatsinks and the frontplate, and I believe this can give around 10W extra cooling capacity. You say pointless.. Well the PC is totaly quiet, small and stylish in the livingroom and I can play the games I like with it. 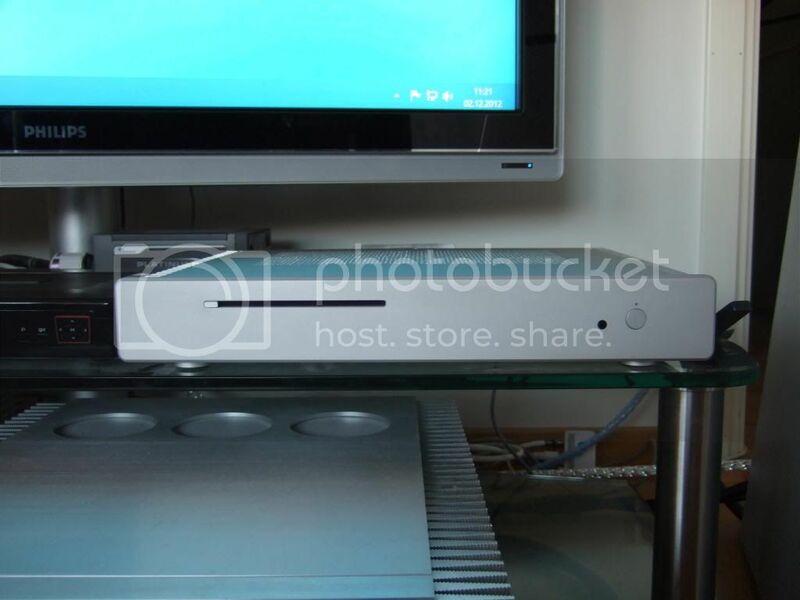 A silent PC that does the job, I should think most readers of the SPCR forum easely sees the point. As for all the work, when I had decided on the FC5 case I wanted to see how mutch cooling capacity I could get out of it. We all have our hobbies, and this was a project I wanted to see through. I have been open about all the work and I have not recommended the same build to anyone else. Internal graphics is a much easier task and also building a FC5 with a HD7750, like explained further up, is also fairly easy. The graphics card hasn't melted yet, hope you take my word for it. But I have pushed the limits so time will tell if the life span will be reduced (if it gives in after a couple of eyars I can upgrade to an eaven more efficient graphic card). The GPU mosfets are cooled with four heatpipes, you can see them on the last picture in the first post. Under the picture I have given some temperatures under use. I cut of a piece of aluminium from the bottom of the case to cover the mosfets. I used the BorgFX Bridge cooling set http://www.hfx.at/at/index.php?page=shop.product_details&flypage=flypage.tp-ecommerce.tpl&product_id=50&category_id=8&option=com_virtuemart&Itemid=54 I had to cut of a piece of the Bridge cooler to get it down to the aluminiumplate and the mosfets. So this took also some work, but the mosfets seems to be cooled enough. This was for a GPU with 150W tdp. For GPU's like the HD7750 (55W tdp) this will not be necessary, maybe the mosfets will be fine also without airflow or else there are many mosfet coolers on the market. Last edited by Highfi on Sun Feb 03, 2013 6:07 am, edited 1 time in total. I have a HFX classic (not yet built) and a HUSH ATX (core2duo). The guys at HFX say it can cool 90W per side. Now the HFX has more metal but the HUSH is better built and it has a thick heat pipe built-in to spread the heat throughout the whole side heat sink. I don't know the figures for the Hush but I've never seen it with more than 65W load per side in any build HUSH ever did. Either the HFX and HUSH are grossly underestimating their cooling capacity or the Streacom guys are grossly overestimating theirs. A GTX670 is over 150W, I was hoping the HFX can run an undervolted 7850hd (130W stock, maybe to 90-100W with undervolting / underclocking). Also, you used way too many heat pipes, one of those 6mm HFX heat pipes can move 30W, if you use four you cover 120W and one of them can fail and still you have the whole 90W per side covered, AFAIK. It's not the heat pipes that are limiting the cooling, it's the heat sinks. Edit: I just saw the horizontal CPU heat sink you're using to supplement the Streacom heat sinks for cooling the graphics card. 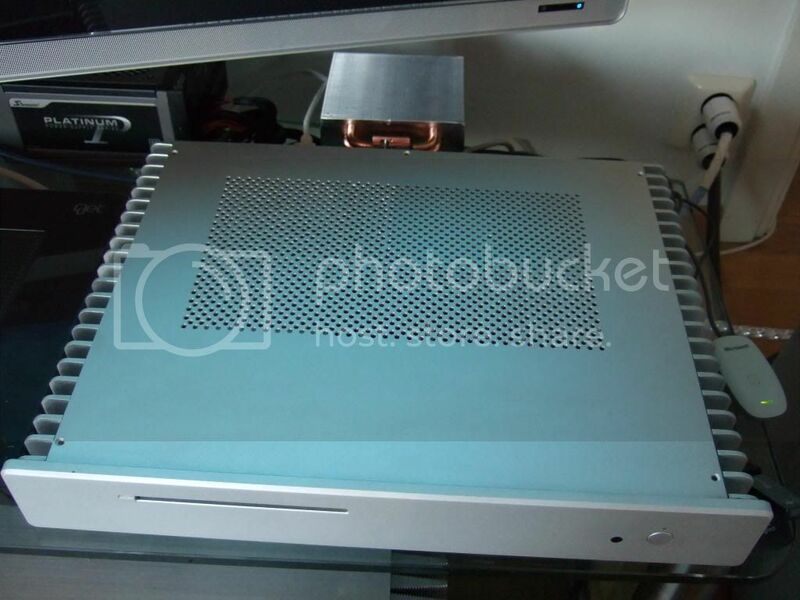 Congrats for the creativity, but with a flexible PCIE riser I would get a longer ribbon cable on the riser, use an ITX motherboard, reverse the orientation of the graphics card mounting it on the bottom of the case with the business side up and running a massive and cheap internal aluminium heatsink on it. I was thinking of buying a low profile AFOX HD7850 and supplementing the four HFX heatpipes with a Thermalright Spitfire hanging over the CPU area but still inside the case. Or, I could run a 45W CPU with just half of one side of the HFX cooling it, the other half going to the GPU as well. That would allow me to run a gtx660 and it seems more reasonable, you don't need more than a 3770t or better yet an undervolted 3570k for a HTPC or for gaming anyway. With the HFX classic you have an excelent case and in my opinion the best passive cooling potential. You are bold in your statements and you should be just as bold in your PC building. In my FC5 there are many heatpipes and I also think it's the heatsinks that are limiting the cooling. The many heatpipes are there to get out the cooling potential of every part of the case. There are four heatpipes to the other side of the case to use the cooling not needed for the CPU (when playing games the CPU don't need the whole heatsink, and if I sometime will do some CPU demanding work I will probably not put a heavy load on the GPU at the same time). That way heat also can enter the frontplate in both sides, using the frontplate more efficiently for the GPU. The coolingtower in the back is just because the case couldn't cool better on it's own, two heatpipes could have been enough but four heatpipes will be more efficient and cool faster. I would not recommend placing a passive heatsink inside the FC5 or the classic. Passive internal heatsinks are often made for airflow by casefans, except a few really big ones. Without fans the cooling depend on the hot air rising and there are other components inside the case (mosfets and northbridge) that need to be cooled down by the little air that's left, it would not be recommendable to warm up the case inside with another big heatsink. 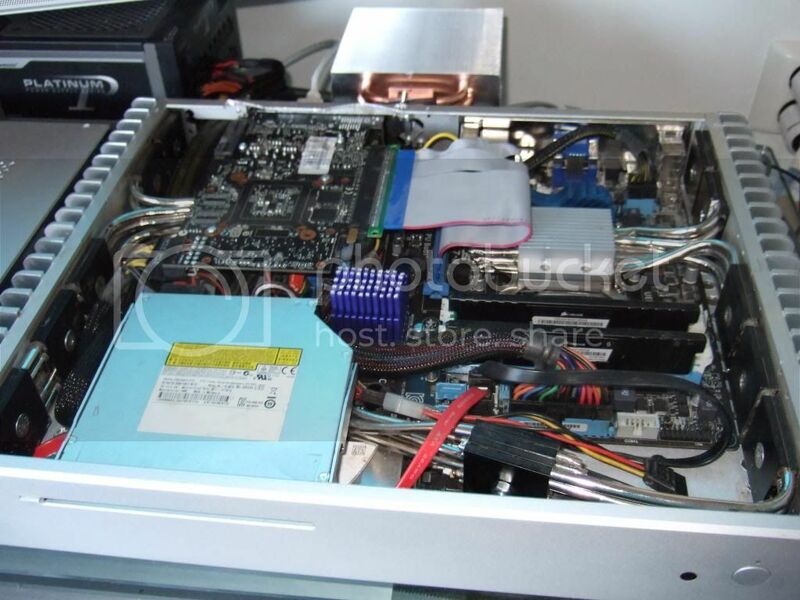 Heatsinks without fans work best outside the case where there is more air and the airflow is better. The HFX classic can in my opinion cool down both the i7 3770k and the GTX 670, so I think HFX is underestimating the capacity some (look at one of the heatsinks of the classic, doesn't 45W in cooling capacity on these big heatsinks seem a bit underestimated?). I have had the classic for over 5 years with a HD 3870 (105W tdp on two heatsinks) and will try to explain how I think it can be done with minimum downside or risk, if any. The classic has four heatsinks and each one of them is bigger than one whole side of the FC5 (which is recommended for 65W and up to 95W). When you build the classic you can try out the CPU on it's own before you put in a graphics card. It's possible to try out a motherboard with the 3770k, take four small heatpipes and mount them on just the closest heatsink in the back. If you just use the CPU for easy tasks like the internet, movies (or later games combined with a discrete GPU) the cooling will never be a problem. I should think you also can perform rather heavy work aswell and maybe it can take away maximum load. It's up to each builder to plan their PC for the load they need. Many will never need to put maximum load on the 3770k. The upside with this CPU is that it's very fast on everything you do, you notice it for example when downloading new programs, especially combined with a good SSD. Is there really any downside besides some extra in the price? There is a big chance everything will be fine, and if not the demanding work that produce too much heat couldn't have been done with a smaller CPU anyway. You mention downclocking, I have never tried it but if you can do this with other CPU's then maybe you can do it with this one also, and you still have the possibility to put on another four heatpipes and mount them on the other heatsink aswell (then you will be safe for shure). I believe the downside here is small, while the upside with making it work is a lot bigger. If the CPU works fine with only one heatsink (which I think it will) then you have tested out the capacity of the heatsink, and this can tell you something about the capacity three heatsinks will have for the GTX 670, or any other card. 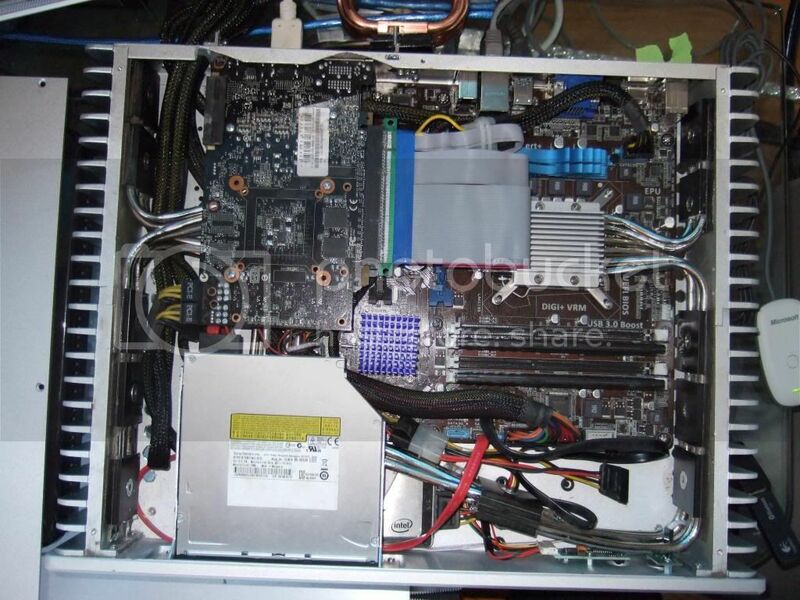 Look at the classic Pilv built: http://www.silentpcreview.com/forums/viewtopic.php?f=14&t=63765 He is cooling down a GPU with 66W tdp with only one heatsink, and he say heat has never been a problem. You can take the four first big heatpipes (closest to the GPU), bend them over and mount them through mountingplates on both heatsinks on the closest side from back to front. To put in a PSU like the Seasonic SS-520FL you must work a bit with the mounting, to get room for the heatpipemountingplates on the front heatsink. Then you take four more heatpipes (small) on the GPU and point them over the card and towards the front heatsink on the other side. You combine them with four more small heatpipes that points down on the other side through the mountingplate on the front heatsink (then these heatpipes and mountingplate will not come in conflict with the heatpipes from the CPU on the back heatsink). If you want to be shure you can mount another four heatpipes on the GPU and bend them over to the closest heatsink and mount them over the first four heatpipes from back to front (these heatpipes can not be mounted on the front heatsink because of the PSU). The VRM on the graphic card you can cool down like I did with the HFX cooling set for the northbridge (or with another cooling set for GPU). The best thing is to get a block of copper or aluminium; 1x2x7 cm, this will cover the mosfets fine, and the 1 cm will get it high enough so you don't have to cut and modify the northbridge cooler. In the corners you drill some holes that fits the holes in the card and through these holes you also mount the northbridge or GPU cooler. On top of this you mount four heatpipes that you bend over to the closest heatsink. You must mod the heatsink with a new hole to attach these heatpipes. The downside with the GPU is just as small as with the CPU. If the heatsink gets too warm with the GTX670 on max, you can still use it for the same games you could have played with a GTX 660 anyway. And maybe you can downclock this card aswell if you really want to. I have no problem using my GTX 660ti and not using it to the max, I use the EVGA precision and can see the temperatures and framerates when I play. And if it for some short moment should pass 100 C I really don't think that will harm the card much, the card will stall if it gets to hot and you see it on the pictures. The upside is a lot bigger, if you could play the 670 on max load, it will probably be the first PC that does it (I haven't heard of anyone else cooling down a passive 670 with no fans at all and watercooling also make some noice). I have tried to explain how I think the classic can be built with both a fast CPU and a powerfull GPU, since I considered this build myself for a while before I went for the FC5. It is of course some work to go through, but for those who are up for it I think the upside could be worth it. 1. gtx660 (undervolted) can be cooled with just one side of the hfx (two heatsinks, four heatpipes) and that makes for a better organized system. 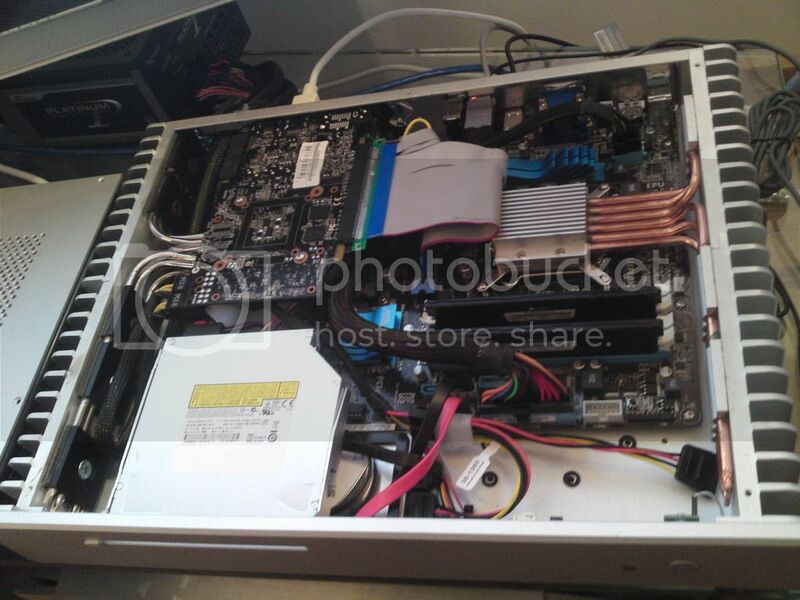 2. a gtx670 needs 6-8 heatpipes and three heatsinks and the performance benefit at 1080p is minimal. 3. if you get a graphics card with more mosfet stages and thery're not spread around the card, you don't have to use heatpipes for the mosfets, a simple big aluminium heatsink is enough. Also, more stages usually means you can undervolt to a lower voltage. My problem is I like the hush better, but that needs more work to be upgraded. I also don't have drills and power tools. Should be interesting to see what they've come up with! Eugenius, you seem to know a bit about mosfet stages and it will save you some work if you could do without the heatpipes on the mosfets. Just be aware of that the heat from the mosfets will stay inside the case if you don't use heatpipes, but I guess this will work fine with enough ventilation through holes in the topplate (or play games without the topplate). The Asus cards are solid but you pay some extra for the good heatsink that you take off when cooling passivly. The standard GTX 660, 660ti and 670 have the same layout and the mosfets has the same heatsink. Maybe this heatsink will work fine on the 660 also without any airflow. Instead of an undervolted 660 there is an alternative in the GTX 650 ti (105W tdp). Moogles, the VGA cooling from Streacom is good news! Then the FC5 case will need no extra modding for a descrete graphic card. I e-mailed Streacom about the 250 Watt PSU some has been talking about and they said that in March they also plan on introducing the Streaflex 250W PSU and a 450 Watt PSU. I hope the Streaflex 250 is a passive PSU that fits lowprofile cases, it will be interesting to see! The Nvidia 650 is crap. I built something similar with my streacom fc5 case (A6-3500K + AFOX 7850 single slot + Dual PSU) except I decided against full passive cooling (hard / expensive to get parts in Australia). Running 2x laptop psu's (1 plugged into the PCIe extender + PCIe power, and the other into a Streacom 120W PSU) worked for me... that is until I upgraded to an i3-3220 + Z77 whereas it lasted ~2 months then my gpu got fried.... though not entirely sure that was the psu's fault (I let it idle at ~70C). I'm just about to have another crack at it with the KFA² GTX 660 eugenius mentioned. Adventus, I recommend you run a 160W+ psu for the GPU, and undervolt it as much as you can. Did you run a heatsink on the mosfets of the AFOX single slot HD7850? How low did you undervolt it? I'm asking because the single slot HD7850 is the best card I can think of for uprading my hush, it has a horizontal pcie riser that only accepts a single slot card. Thank you Adventus! Hopefully the GPU cooler Streacom say they will introduce in March will be easier to get. Sorry to hear about the AFOX 7850. The airflow in the fc5 case is not good so maybe components with fans will struggle to get the hot air out of the case. When Streacom introduces the GPU cooler I think this will be the best way to cool a graphic card in the fc5. Eugenius has mentioned a couple of cards he think has solid mosfet stages. It's a good solution if the mosfets can be cooled with just a heatsink, and I also think it should be possible. If the GTX 660 can be undervolted enough maybe the card could be cooled down by the heatsink on the fc5, but I have not tried undervolting myself. If you put thermal paste between the heatsink and the frontplate and backplate of the fc5 you can get some extra cooling. Then maybe the GTX 650ti or other cards with around 100W tdp could be cooled down enough. Since the mosfets take away some heat some say the actual heat from the GPU will be a bit lower than the estimated tdp. Interesting to hear about your dual psu's. I tried dual psu's but couldn't make it work. This will open for more powerfull components in lowprofile cases. Good luck with the KFA GTX 660! The airflow in the fc5 case is not good so maybe components with fans will struggle to get the hot air out of the case. Yeah, After a couple of months of use I cut a hole in the top of the case which attached to the output of the gpu fan.... So It was ventilated pretty well. After changing to the i3 the CPU never overheated.... though the GPU still reached 95 C during games. Interesting to hear about your dual psu's. I tried dual psu's but couldn't make it work. Are you sure it wasn't the PCIe riser causing your troubles? Did you run the gpu power supply through a picoPSU first? or directly wire it. 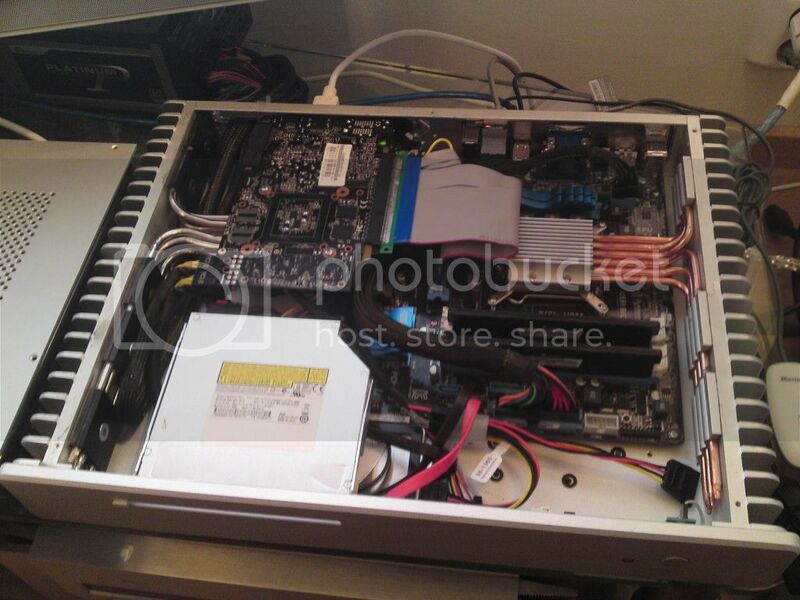 I used a 192W Laptop PSU (largest I could find) directly wired to the GPU before, so I should be able to reuse that. I didn't have anything beyond the standard cooler, I was working on improving the cooler when it blew. Personally, I would not suggest the AFOX 7850 mainly because it's fan was very loud (but I guess your passively cooling?) and I could not find any software which could undervolt it (and I wasn't prepared to load a custom bios after read someone else breaking theres)... I think it uses some non standard components which nothing supports. My GTX 660 arrived today (at 7.30am I might add). I plan on drilling some holes in the bottom of the case and possibly raising it off the ground a bit with some spacers to aid airflow (If air flow is still a problem I'll mount a noctua to exhaust through the top grill). Then mounting the board beside the motherboard (not in the PCI slot) and using a short male DP to female HDMI cable. Kind of regretting cutting the hole in the top of my case now ... might have to make a new one. This streacom GPU cooler sounds interesting though, so I might hold off until that is released. Adventus, I thought you ran it with some kind of modded cooling, why would anyone get a Streacom and use that single slot cooler in it is beyond me. Actually if you're not going completely fanless, getting a specialized heatsink case like this is not a good idea at all. A CPU can be easily silenced and most can run completely passive while idle with just a big heatsink (thermalright hr02 etc). It's the graphics card that's the problem with both noise and heat. We badly need a new form factor that moves the cooling space from the CPU to the GPU. I always wondered why more manufacturers don't reverse sides on the graphics cards. That way you have a lot more space for cooling and you don't block any slots and the heat doesn't get trapped under the card. With that layout you can take out the stock cooler and mount a huge CPU tower cooler on it with a low speed fan that only starts during load. If you've ever seen a CPU cooler modded to fit on a GPU, it's laughable how much lower the temps are. There are plenty of low profile or off-center heatpipe coolers to make room for the horizontal GPU cooler. That way the cutouts for fans in the top of the case that are so popular right now start to make some sense. I guess water cooling won because it includes cooling the ram, the mosfets and mostly because the margins are bigger. Yea modding the cooler was always the plan though my only real requirement was for the computer to be 100% silent at idle / watching movies, which it managed if I allowed the AFOX to idle at 70C. Santa came and brought a 60W gtx750ti. Now streacoms can have fanless GPU's without melting. Yes! 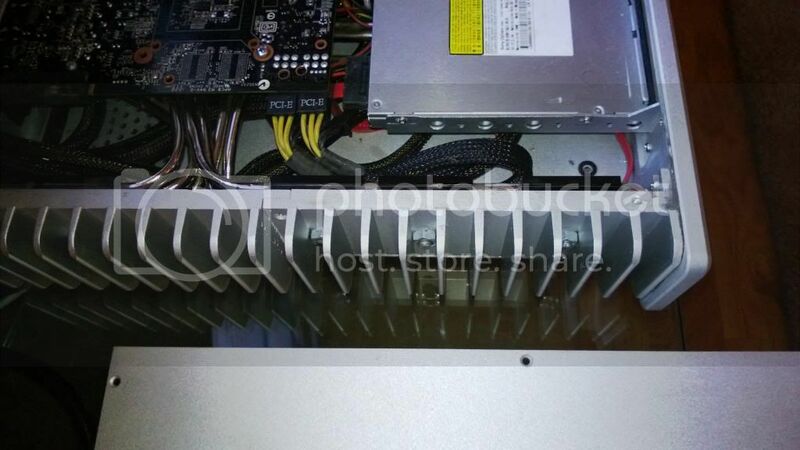 Also Streacom has a new 250W passive PSU on its way. This will then mean you can have a proper PSU on the inside of the case! The forthcoming DB4 also looks very interesting.